team we're always looking for ways to make developers' lives easier, so you can focus on building interesting applications instead of worrying about managing infrastructure. We also want you to be as productive as possible when you're busy writing code. We provide an SDK which offers access to production APIs, in a way that's compatible with a local development environment. But sometimes you just want to dip your toes in the water, and the prospect of setting up a local development environment seems daunting. What if you just want to try out some sample code? What if you want to see how the actual production APIs will behave? What if you could share a code snippet with a colleague and your entire environment came along for the ride? 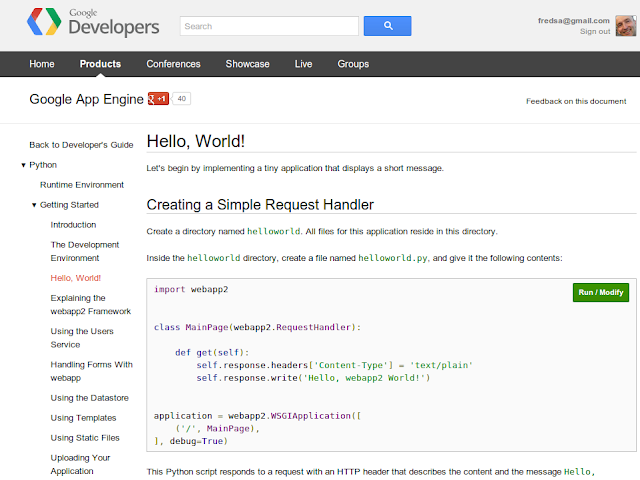 What if there was a playground where you could try out APIs, all from within your web browser? We asked ourselves these same questions and decided to try an experiment: we created a Cloud Playground, a place for you to quickly test production APIs you're interested in using. 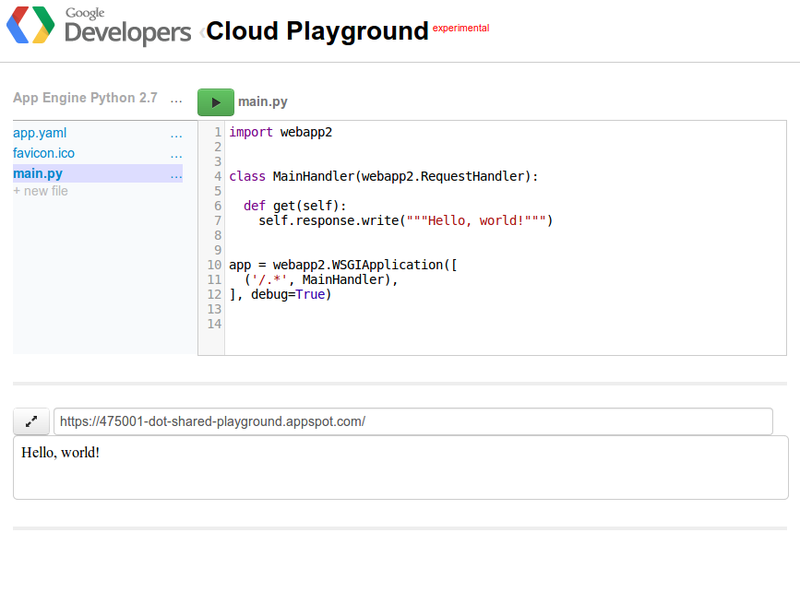 Note: the Cloud Playground is currently limited to Python 2.7 App Engine apps. To get you started, we added little green buttons to our getting started documentation, which take you straight to the Cloud Playground where you can edit and run the guestbook sample code as it appears in the documentation. In addition, the main Cloud Playground page offers easy access to many more samples. 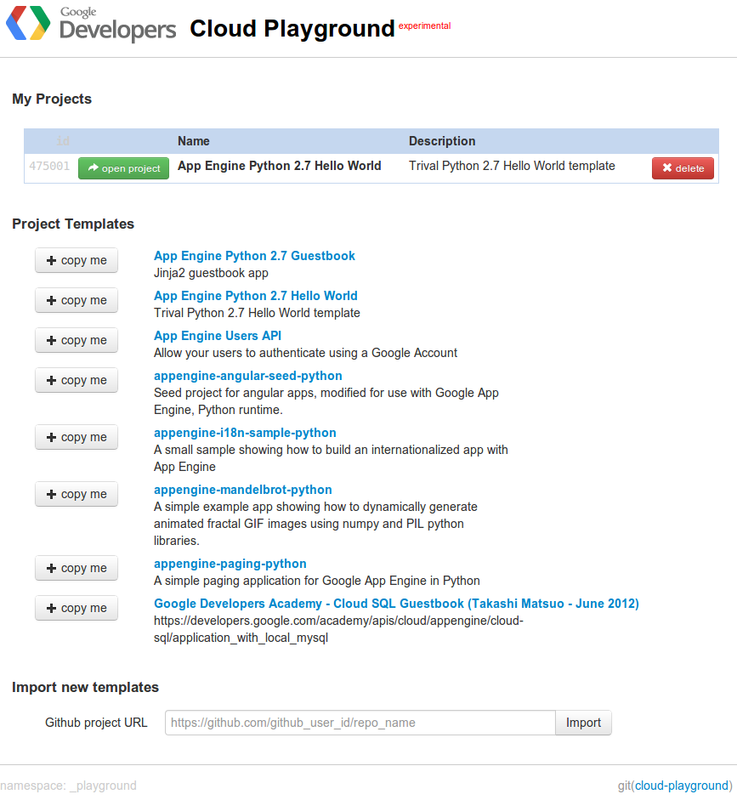 There's even an option to clone other open source App Engine Python 2.7 template projects from Github. mimic is a regular Python App Engine app, which serves as a development server (similar to the App Engine SDK "dev_appserver"), but which runs in the production App Engine environment, providing you access to the production APIs and environment while still offering a quick and easy way to test out bits of code. bliss is a trivial browser-based code editor which lets you edit code in the mimic virtual file system (backed by the App Engine datastore), providing you with a user interface so you can see what the mimic app can do for you. 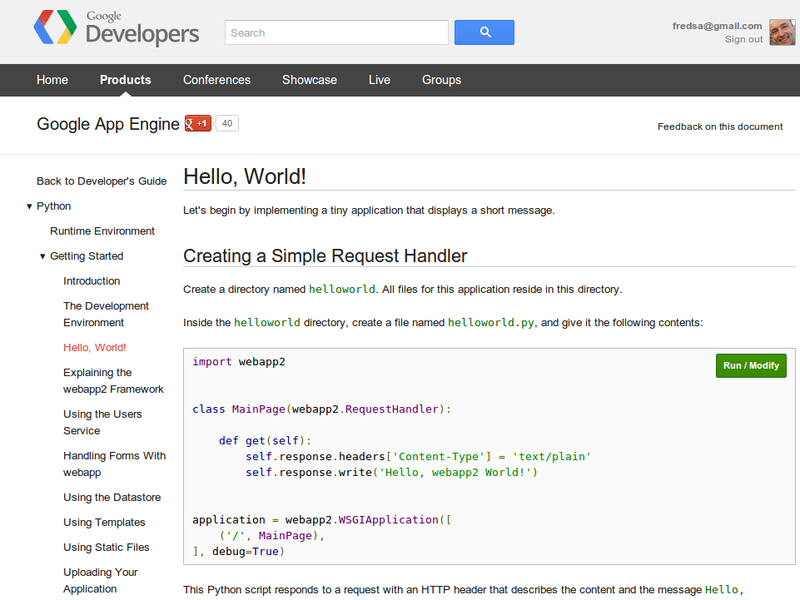 We previously blogged about DevTable which also uses mimic to speed up refresh cycles for their App Engine developers. We look forward to seeing what you're able to build. On the Google Cloud Platform team we're always looking for ways to make developers' lives easier, so you can focus on building interesting applications instead of worrying about managing infrastructure.